It's hard to believe Julee Rosso and Sheila Lukin's The New Basics Cookbook is over 26 years old. The number one song in America when this book came out was Bobby Brown's "My Prerogative," his first (and only) #1 hit. Back then an "app" was something you ate before an entree and a "tweet" was a sound a bird made. Nobody bought music from Apple (unless you count the record companies). Cell phones wouldn't find in your bag, let along your pocket. Well, you'll be chirping with delight if you make this easy tomato sauce for pasta. After my mother's spaghetti recipe, this was the second pasta dish I learned to cook when I was in high school, and it's still a hit today. I made a couple of minor alterations. The original recipe calls for a mix of fresh and canned tomatoes, but since it's summer, I went with all fresh. I also substituted fresh basil for the recipe's flat-leaf parsley and upped the volume of fresh herbs, since fresh basil is so wonderful with tomatoes and, after a failed first attempt earlier this summer, I have a beautiful basil plant growing on my balcony now. 1. Bring a large pot of salted water to boil. Cook the pasta according to package directions for al dente. Drain pasta and set aside. 2. Heat 1/4 cup olive oil in a large skillet over medium heat. Add garlic and cook until softened, about 1 minute. Add the fresh tomatoes and tomato paste and stir to combine. Season with salt, pepper and nutmeg and increase heat to medium-high until the mixture bubbles, then decrease heat to medium. Simmer until the tomatoes are tender and falling apart, about 10 to 15 minutes. 3. Preheat oven broiler with rack about 4-5 inches from the broiler. 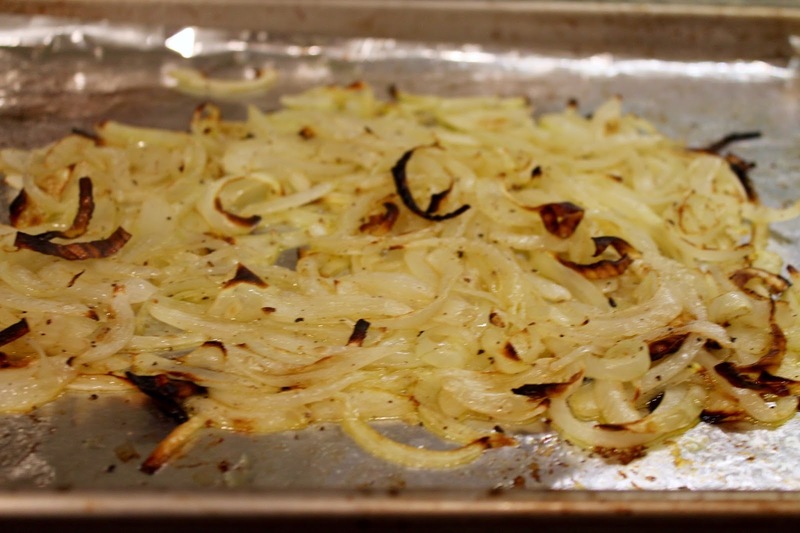 In a medium bowl, toss the slivered onion with 1/4 cup olive oil, salt and pepper. 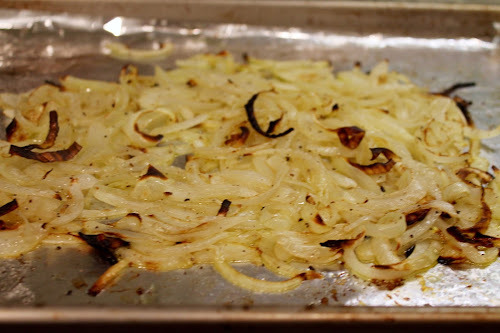 Spread onion mixture on an aluminum foil-lined baking sheet in an even layer. Broil about 5-7 minutes, stirring every couple minutes, until the onions are lightly golden brown (be sure to stir to prevent onions from burning--some will still be quite browned around the edges, which is fine). Set onions aside. 4. 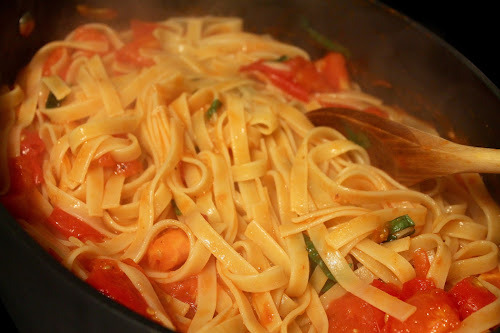 Stir the pasta and fresh basil into the pasta sauce and turn off the heat. 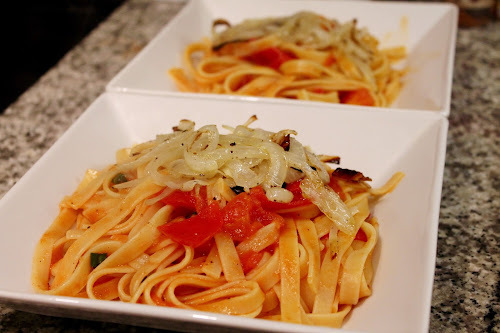 Serve the pasta in shallow bowls topped with some of the broiled onions and grated pecorino-romano cheese at the table.